The residential gas detectors series "PATROL" have been designed to offer the customers devices representing the highest technology for the detection of CO in residential premises. Detection is performed by employing electrochemical cells for Carbon Monoxide (CODETECT). 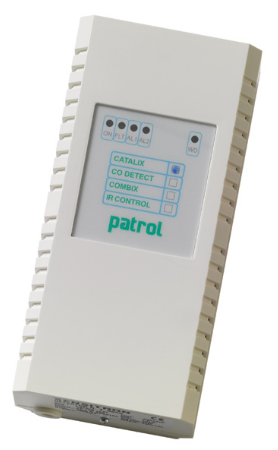 The "PATROL" gas detectors for flammable gases offer a double alarm threshold as Pre-alarm and Alarm that generate when the preset alarm thresholds have been attained. A visual (LED) and audible (buzzer) indications warn of the potential dangerous situation while relay activates only in case the Alarm threshold has been exceeded. Whenever either the sensor or any electronic components get damaged, a Fault condition generates, activating the corresponding warnings. The detectors have a WD signalling for the microprocessor control system that activates if faults occur during operation Detectors "CO-DETECT" have been designed to fully comply with the European Standards for gas detection in residential environment EN 50291. As far as "CO-DETECT" is concerned, the European Standards EN50291 requires that relay intervention be temporised as a function to the CO contents reached within a given period of time: the higher is the concentration, the sooner the relay will activate, as described in table 1.